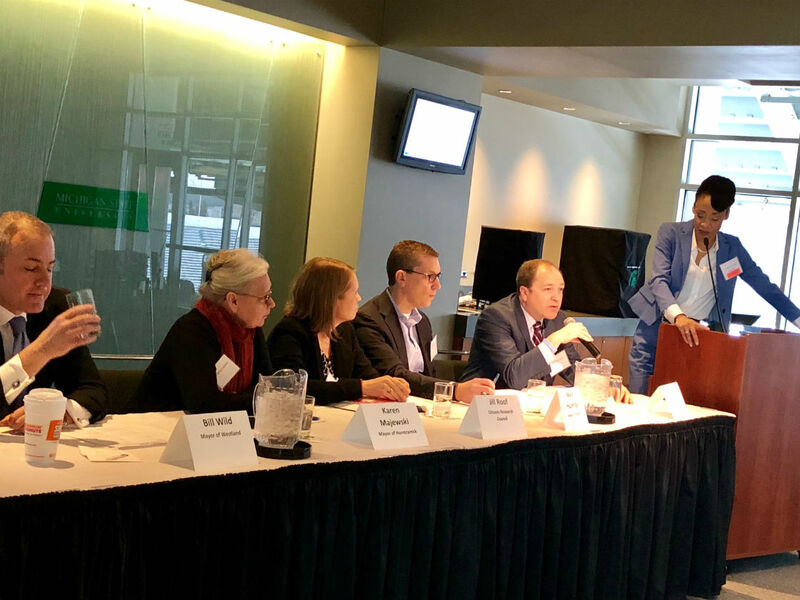 Bridge reporter Chastity Pratt Dawsey moderates a panel on creating thriving metorpolitan communities at the 2018 Michigan Solutions Summit on Good Government on March 14, 2018. Michigan’s economy is mostly recovered from Great Recession, but more than 150 communities still face serious long-term financial challenges. The next frontier of money problems? Suburbs, says Eric Scorsone, deputy treasurer for Michigan. “My guess is that the next wave of fiscal problems will be more likely in the suburbs than the cities,” Scorsone said. As Detroit and other cities rebound, “the problems are moving, they’re migrating,” Scorsone said. All agree there is no one solution. Roof suggested state lawmakers give local units of government more taxation options to consider for their city in order to curate a variety of revenue streams. Huizenga said municipalities should “keep their house in order” by paying down unfunded liabilities, minimizing borrowing and encouraging public-private partnerships. Minimizing bonding, paying for projects up front and paying down unfunded liabilities. He also emphasized the importance of cities being business friendly to attract jobs and leveraging public-private partnerships, offering Walker as an example. “We’ve really worked to strive to be open to business. We’ve really had to change the culture to not just say here’s a policy, but go above and beyond” to implement those policies and help businesses grow, said Huizenga, who is a candidate for the state House. All agreed unfunded liabilities such as pensions are ongoing problems, and Wild said legacy problems force cities to innovate like never before. He said local communities need more help from Lansing. He also said state legislators should take a hard look at how they’re evaluating their own success. Hamtramck emerged from emergency management this month, and Majewski urged state lawmakers to show “funding leadership” on issues such as infrastructure and transit that are enormous costs for local governments. Majewski said that while there are many benefits when cities are taken out from under emergency management, it’s important to address the cause of Michigan’s funding needs, and critically analyze how legislators balance the state’s fiscal needs with municipalities’. She also advocated for “funding leadership” from the state on larger infrastructure and transit challenges, which she said are enormous costs for local governments to handle on their own. In the end, she said, economic growth is the only sustainable solution to cities’ financial woes. “We’re not going to cut ourselves out of these problems,” she said.